Whilst Georges Leekens’ side had their fate firmly removed from their grasp, the consequent pressure removed from them had the potential to enlighten their performance, as fans hoped to see the tasty, free-flowing Algeria side that can be so wonderful to watch on their day. Instead, it was the same old same old, as disjointment, incoherence and frustration informed their final flurry in Gabon. Only the stones of a Tunisian defeat to Zimbabwe were able to pave the way for Les Fennecs to reach the knockouts – and that was only if Algeria managed to beat Senegal themselves. Twice pegged back by a significantly weakened Teranga Lions side, it was only a point they managed to muster, disregarded the other game going on in Libreville all together. Remaining awkward and disconnected from one another, they looked like a product of the external upheaval that had occurred manager-wise for the past year or so, with only occasional bits of magic from Mahrez and some sort impressive stuff from Sofiane Hanni providing the highlights for Algeria fans. It could be summed up by Islam Slimani, who – despite scoring two goals – somehow managed to still not play particularly well. Cracking out your 2nd string can be a dangerous when your path to the knockouts is already secured. That tradeoff between risking injuries/tiredness of key players with the loss of rhythm of a successful side is a real difficult one to get right, with Aliou Cisse opting strongly for the former of this particular set of options. 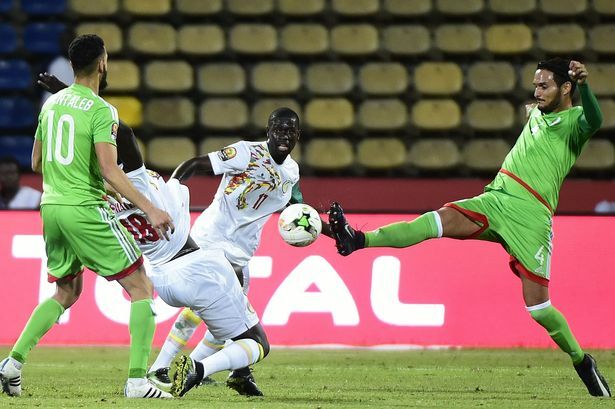 Captain Kara Mbodj was the only survivor from the starting line-up against Zimbabwe, as viewers half expected Senegal to sit back and rest their legs for matches that actually had some meaning. This, however, was not the case – Cisse clearly challenging his backups to go out there and prove themselves. It wasn’t a particularly high quality performance, but certainly one of real graft, as they regularly tried to spring attacks and put the Algerians under pressure – rewarded with two well taken goals. These were greeted with fantastic celebrations from the bench, as those removed from the starting line-up embraced those on the field, demonstrating a wonderful togetherness that is so difficult to attain in international football. Cisse has clearly done something to this team. Whilst they’ve only really produced one exceptional performance, that undefinable bond they have between the players will be what sees them through if they are to go far in this competition, as Cisse looks to send a reminder to African football that you don’t have to always look to Europe for managerial decisions. Now begins a period of reflection for Algerian football, and boy do they need it, as a tumultuous 12 months comes to an end and gives the country a bit of time to really think about where they go next. With four managers taking charge in a single year (presumably soon to be five, with Georges Leekens unlikely to be kept on), some consistency is what this team needs. A coach who’s willing to commit for a few years, who can implement a realistic project quickly and effectively, and inject some confidence back into these players. This might be exactly what they need and it could be so much worse. Algeria have some sublime players at their disposal, but as their general moany disposition showed in Gabon, this is not a happy side. Someone who can show faith in this team and get them playing to the best of their ability is what is needed, with a big decision just around the corner for the Algerian FA. Four goals, four different goalscorers – Tunisia’s win over Zimbabwe should shut down any notion that Henryk Kasperczak is taking them back to the dour stereotype of the past. With Ahmed “The Helicopter” Akaichi benched and Yassine Khenissi recalled to the starting XI, the Carthage Eagles looked much more fluid in attack, and by half time they had smashed four goals against the woeful Warriors defence. Youssef Msakni and Naim Sliti both impressed. Sliti scored the first and set up Msakni for the second. Msakni was at his most exquisite, putting on a great show for the few fans present. Khenissi did what Akaichi is yet to do in Gabon and scored the third, while Khazri added a penalty just before half time to put the game beyond the reach of the minnows. Considering we all waxed lyrical about Senegal’s display against the same Zimbabwe team, we ought to do the same about Tunisia’s and suggest that maybe this team is coming together nicely for a run at the title. They have loads of attacking options, and Ferjani Sassi and Mohamed Amine Ben Amor make a fine midfield pairing behind them, controlling the game very effectively in the same way Kouyate and Gana Gueye did earlier this week. Kasperczak has got them playing some very attractive football. The only question mark hangs over the defence, which is uncharacteristically yet to keep a clean sheet. Naim Sliti has had a pretty odd career so far. Born in Marseille, he came through the Olympique Marseille academy but failed to make it into the first team, dropping into the French lower league scene with Sedan and Paris FC. But since joining the latter’s rivals Red Star in 2014, his career has taken off, riding the wave of their promotion to Ligue 2 and their 5th place finish last season to eventually join Lille this summer. In June, while still at Red Star, he made his international debut, scoring against Djibouti, but he didn’t enter the tournament as an expected starter. However, his performances at this AFCON have repaid Kasperczak’s faith in him and have likely established himself as a starter for at least the rest of the tournament. Despite his inexperience, he has been Tunisia’s best attacking outlet in this tournament. Whether he can build on this is going to be interesting to see. Too often Tunisian attackers have blossomed, only to regress or suffer from painful inconsistency – witness team mate Msakni, who has only recently been recalled to the national team and is now in great form again after an indifferent few years. But even so, his rise from part-time league nomad to Ligue 1 player and international star has been one of the great stories of this AFCON campaign so far, and with Tunisia looking increasingly confident, this may continue for a while yet. An early contender for Player of the Tournament? At SFG Towers we have very much enjoyed having Zimbabwe in this tournament. From Khama Billiat’s silky skills against Algeria to Knowledge Musona’s wonderful first goal today, via plenty of general shithousery from the likes of Willard Katsande and Costa Nhamoinesu, and some great goalkeeping from the young Dynamos prospect Tatenda Mkuruva. Their attack has been up with the best we’ve seen in Gabon, and they have shown they can dish out just as much intimidation as they have received – in all three games they showed no fear of the physicality of their opponents and never looked like being outmuscled. It was always going to be tough for the Warriors, drawn into the toughest group in the tournament for their first AFCON since 2006. But only when faced with a primed and confident Tunisia attack in the first half today did they looked a little overawed, and even then they kept trying and did pull two goals back. The team have soared well above expectations in qualifying to begin with, let alone with their impressive performance against Algeria. They may have been outclassed in the end but they can take back some wonderful memories and take great confidence from the way they have competed against some of the continent’s best players and teams. If they were to somehow produce a defender or two as good as Billiat or Musona, or even just sign a coach who can get them more organised at the back (apologies to Callisto Pasuwa who has done a great job in helping them reach AFCON), they could become regular qualifiers – their best players are young enough that they have a few more shots yet.